Where: Chef Donna’s Private Residence in McLean, VA (The exact address will be included in your order confirmation; the location IS NOT Metro accessible – closest metro is 20 minutes away and there is no bus route). In this series of exotic fare from around the world, Professionals in the City invites you to cooking demonstrations of palate-pleasing cuisine, exquisitely prepared and presented by the country’s finest chefs. Each event is independent with a different renowned chef. You need not attend them all. As an extra, you will not only eat the lavish meal prepared, but you will be provided with written recipes for this meal. Internationally and renowned Iron Chef Roberto Donna invites you to his home to enjoy a fabulous opportunity to cook with him, hands on, in his kitchen. Class will be held in his private residence in McLean, Virginia and includes signed apron, recipes, and a 5-course lunch with beverage. You’ll learn how to make spectacular Napolitano dishes to include: Macaroni Timbale, Minestra Maritata, Linguine & Lemon Sauce, Insalata di Rinforzo, and Soft Amalfi Coast Lemon Cream. Roberto will teach you all about Italy’s great variety of flavors and tastes while utilizing fresh ingredients available at our local farmer and Italian markets. Born in the Piedmont region of Italy, Roberto Donna arrived in Washington, DC at the age of 19 with almost a lifetime of cooking school education from his native Torino and throughout Europe. In 1984, he opened the highly acclaimed Galileo. The addition of his Laboratorio and Osteria had made Chef Donna’s restaurant a destination for those seeking the finest in Italian cuisine. Wine Spectator called Galileo one of the “10 Best Italian Restaurants in America,” and continuously honored Chef Donna with its Grand Award of Excellence for Galileo’s comprehensive wine selection. Among the many accolades bestowed upon Chef Donna, one of the most notable came in 1996 when Galileo was named one of the twenty finest Italian restaurants in the world by the President of Italy. 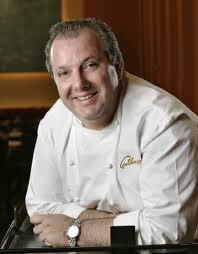 Roberto recently opened Galileo III in Washington DC, but will continue to host intimate cooking classes at his home. Enjoy cooking with one of America’s top chefs in his kitchen! If you have any dietary restrictions, please let us know prior to the class by sending an email to dc@prosinthecity.com or calling us at 202-686-5990. Chef Roberto is happy to make changes to the menu to ensure that you have an enjoyable lunch! IMPORTANT NOTE ABOUT THE ADDRESS AND DIRECTIONS: The address and directions will be on the confirmation page immediately after you register. Please write them down. The address and directions will also be emailed to you in your order confirmation immediately after you register. If you do not record the address and directions that are listed on the confirmation page, and if you do not receive an email confirmation within an hour of registering, please let us know by emailing us at dc@prosinthecity.com or calling us at 202-686-5990. Spam filters sometimes block emails from going through and we have no way of knowing when this happens, so we cannot be responsible for your not knowing the event address or directions. Order through our secure server by clicking the “Buy Tickets” link above or call 202-686-5990. We accept Visa, Mastercard, American Express and Discover. A relaxed weekend in one of the best hotels* in the world! If it were up to us, it would be Mother’s Day every month. Or maybe even every week! But since mothers are being thanked for all the wonderful things they do only once a year, we thought it would be best to thank them in style. With a weekend in the Sardinian luxury hotel Faro di Capo Spartivento, which was named as one of the top hotels by TripAdvisor.com*! The flight and the ride to (and from) the hotel are included, and the winning mother can bring one of her beloved ones, too! You can start sending us your reasons why your mother should win on the 27th of April, but no later than the 5th of May 2011, 12.00 PM CET (6 am EST). The winner will be declared on Friday the 6th of May, which is two days before Mother’s Day**. ** Yes, we know it’s not Mother’s Day on the 8th of May in *every* country, but it is in most parts of the world. 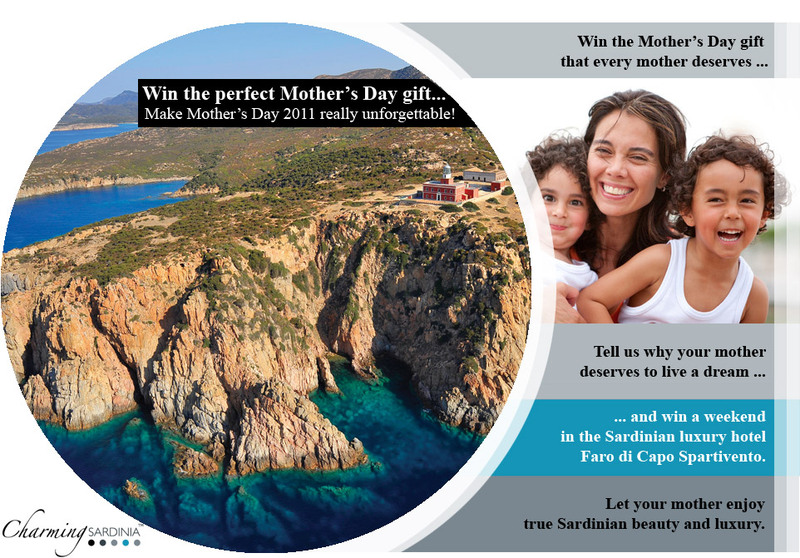 Everyone can enter the contest, simply by stating why his or her mother should win a trip to Hotel Faro di Capo Spartivento in Chia, Sardinia (Italy). You can use many online platforms, such as Twitter, Facebook or your (Tumblr) blog, but you are not limited to using only one. The winning mother is rewarded with a stay in Hotel Faro di Capo Spartivento from the 13th of May 2011 until the 15th of May 2011 (the first weekend after Mother’s Day). These dates cannot be changed, so make sure that your mother is free to travel on the 13th of May! Facebook: Simply leave a comment on our Facebook page with the reason why your mother should win. Although liking our Facebook page isn’t required, we would -of course- highly appreciate it! Twitter: Give a reason why your mother should win in under 140 chars. Make sure to include the hashtag #mymomrules in your Tweet so we can find your Twitter entry. Mentioning our Twitter name (@charming_italy), following us or linking to our contest page isn’t mandatory, but we’d obviously love it if you did. Start Tweeting now! Blog: Write a blog post about why your mother deserves to win. You can either link to our website (so we can find your entry very easily), mention your post to us via Facebook or Twitter, or you can email it to us – whatever you prefer.